I know quite a few people that have a serious soft spot for 1985’s Silver Bullet, and with good reason: the film is solid. It’s held up well for the past 32 years, which is saying something in the age of fickle supernatural horror film fans and the fierce competition from Stephenie Meyer (okay, I’ll give you a minute to stop laughing). If you need something to watch this weekend, here are five reasons to go for a werewolf story on a warm August weekend. I am one of those people – I like my films to have at least as passing resemblance to the source material if it’s adapted. Given, I operate in the realm of cinematic realism: I know that logically, there are some things that can and can’t be adapted into a movie. 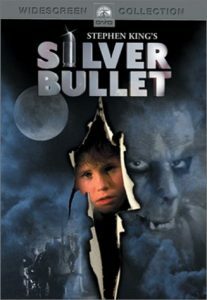 Silver Bullet started out life as a 1983 horror novella from Stephen King, and King himself helped develop the screenplay. This is one of the stronger adaptations, as it keeps the same format and follows the plot of the novella nicely. The things that are changed are only for ease of filming. For those of you that enjoy congruency, it’s a welcome change from having to pull your hair and scream that something was unnecessarily changed and poorly executed. 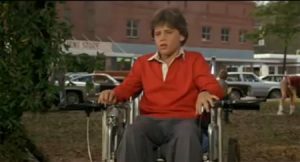 The main character of both the novella and the film is a disabled child named Marty (Corey Haim). Marty is paraplegic, and as such, we get a hero that we’re not used to seeing. Everyone is used to the hero being the scrappy underdog nerd who gets the girl and proves his physical and mental strength to save the day. We’re not used to seeing someone who has physical limitations. It’s not just that: we get to see elements of unease around Marty, and attempts to look past his disability. We see the awkwardness and resentment of some of the other characters, which I think it a bit more honest of a portrait than some of us were expecting. The glory days of Corey. Like its source material, this film starts out in January and takes us through December. There’s a bit of anchoring around holidays and fun times, which functions as a nice frame for our action. The good news is that there’s no quick fix here: someone doesn’t scream “WEREWOLF!” at the beginning and drag us through 12 painful months of trying to catch it while we get bored. We get the dawning realization and suspicions, then the plans, then the action. It comes off as logical and well-paced, and it doesn’t overplay its hand. Gary Busey’s character, Uncle Red, is an alcoholic black sheep. I’m not sure how far off from the truth this is, but watching Busey take on this role in the 80s before he became the Busey we all know and love today is a thing of beauty. He manages to inject some caring into the role along with his usual level of Busey-ness, which makes for a good portrait of that weird drunk uncle (or aunt) we all have. And if you don’t have that uncle, at least you can picture that drunk uncle that would totally buy your werewolf story in part thanks to him. Cards on the table: not all of the effects are good. The downside of modern, cutting-edge gore effects means that anything less than perfectly realistic is going to get skewered because it looks obvious. The positive side of it, though, is a delightful reminder that this is just a movie. And that’s not always a bad thing – if something looks too real, it can be immensely unsettling and cause your mind to start filling in blanks that should be left blank (thanks a lot, anxiety). It’s great to look back at something and marvel at the fact that it scared people back in the day. If all else fails, you can chuckle at the way the effects have aged. Either way, it’s a good time. Silver Bullet is available for rental on YouTube and Amazon. Again, effects by Carlo Rambaldi, the hack who created E.T. Great article, Erin!